In case you haven’t heard, it’s been raining here in Pittsburgh. A lot! This is mostly from the remnant of Tropical Storm Gordon that came ashore in Mississippi on September 4 and arrived here September 8. We were in a drought but now it’s been raining for three days. 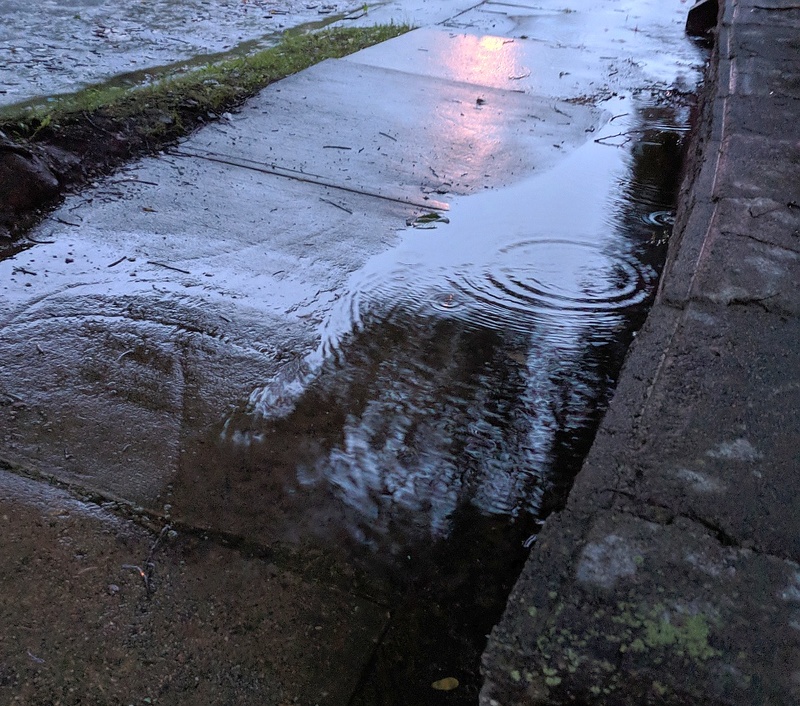 Yesterday set a record of 3.73 inches at the National Weather Service in Moon Township but it’s rained even more in the South Hills. Since Friday morning 7.5 inches have fallen at the Allegheny County Airport in West Mifflin (as of 10 Sept 2018, 7:53a). And it’s still raining! On the left, the 10th Street Bypass is flooded and closed (hard to see through the rain-splashed cam). On the right, the I-376 “bathtub” at Stanwix Street hasn’t filled yet but it’s going to, so it’s closed. And the rivers are rising. 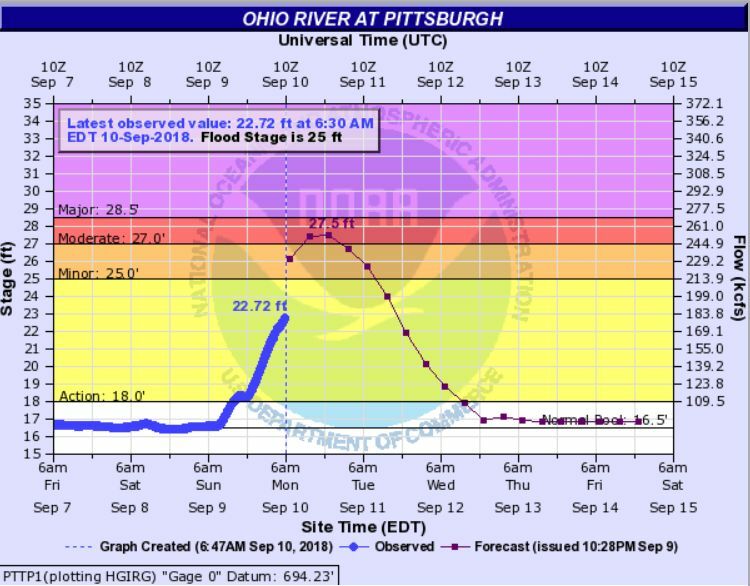 Here’s the National Weather Service’s Ohio River prediction for Pittsburgh. Uh oh! Fortunately our house and street are fine (photo at top) but I feel bad for those who live in the valleys. does this rain effect how the sparrows fly? my dog is bringing them in house. very strange. Yes, Nadine, if they get soaked they can’t fly well. The birds have been hunkered down and waiting to eat for several days. Fortunately it’ll stop raining tonight. My wife Meg just heard a report that yesterday had the second highest one-day rainfall total in Pittsburgh history (presumably as measured by the National Weather Service). Associated with extratropical cyclone Gordon, yesterday’s rainfall was surpassed only when extratropical cyclone Ivan passed us in September of 2004. Yesterday was truly historical, for what it’s worth.